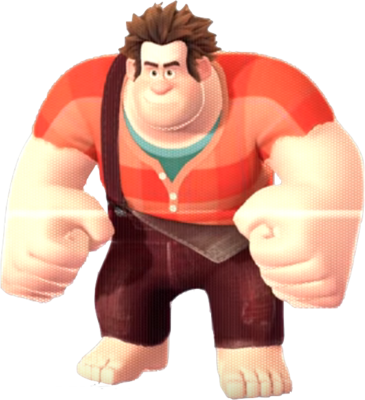 Wreck-It Ralph is a summon from Kingdom Hearts III. He is originally from Disney's Wreck-It Ralph. He is obtainable after beating the Verum Rex mini-game in Toy Box. Wreck-It Ralph is a large giant of a man, especially in his arms which are meant for crushing. He has spiky dark brown hair and thick eyebrows. He wears brown overalls with one strap across his right shoulder while the left strap is broken. He wears a red plaid shirt with a green undershirt. He is barefoot. His Link is known as 8-Bit Blast. Sora rides on Wreck-It Ralph's shoulders. Wreck-It Ralph can tackle enemies using Rush. He can also place blocks which have lights which can stun enemies, letting Wreck-It Ralph attack them. Wreck-It Ralph first appeared as the titular protagonist of Disney's 2012 film Wreck-It Ralph, voiced by John C. Reilly. He is the main antagonist of the fictional arcade game Fix-It Felix, Jr., in which he, due to his home having been demolished by citizens of Niceland, decides to wreck Niceland's buildings in revenge. However, Ralph has been unappreciated by the game's characters due to his role as the "bad guy," and desires to be a hero for once. At his game's 30th anniversary, Ralph decides to venture out into Litwak's Arcade to become a hero, stumbling upon the first-person shooter Hero's Duty in the process. While acquiring the game's medal to prove his status as a hero, he accidentally awakens a virus known as a Cy-bug and, after a series of mishaps, is transported into the racing game Sugar Rush. Teaming up with resident glitch Vanellope von Schweetz, Ralph sets forth on a mission to prove himself as a hero and to help her fulfill her dreams as a racer. Ralph's adventures are continued in the sequel film Ralph Breaks the Internet, where he and Vanellope enter the Internet to save Sugar Rush from destruction.